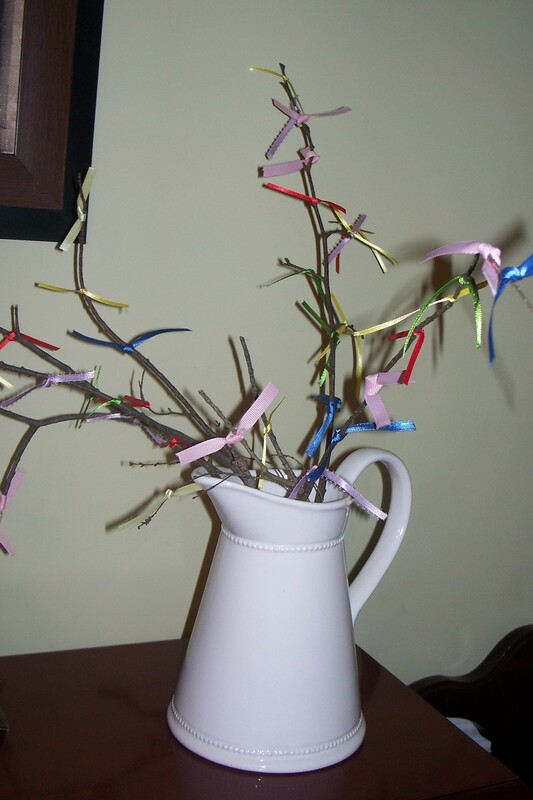 Before we are too far removed from Lent, I want to tell you about our “Lenten Tree.” The idea was not mine. On Ash Wednesday, a little bare tree was positioned at the front of the sanctuary at church. Throughout Lent, people were invited to come to the tree during the final hymn of the service to tie a colored ribbon on a branch. Each color represents a different kind of prayer. The tree that was barren is bursting with color by Easter Day. Our prayers create the beautiful connection that we may have with God…the very reason for Christ’s birth, death, and resurrection. So I snitched the idea for our house. You may recall my Valentine tree. Well, after Valentine’s day, the hearts were taken down, and my family began adding prayer ribbons. I made an envelope of cut ribbons that sat on our piano. I listed the color scheme on the outside of the envelope. And little by little our tree filled up with beautiful prayers. The most common colors were pink (for wisdom) and purple (giving praise). These were mostly tied by me, and they truly reflect the place that I am in spiritually and emotionally. My family is at a crossroads in many important ways. My hubby is graduating this spring, and he is on the job hunt. We’re trying to make a decision about our older son’s kindergarten arrangements for next year (made more difficult by the job hunt), and I’m contemplating re-enrollment in my graduate program for the upcoming summer session. Over the last few months, I’ve spent a lot of time contemplating these major decisions, and I’ve needed God’s wisdom in these matters (since my own is so very short-sighted). And through all that contemplation (a.k.a. worry), I keep reminding myself that I want (and need) to praise God for all the things that are certain (His love) and for the adventure and opportunity of all the unknowns. As Holy Week progressed, I made plans for our fifth annual “Maundy Meal.” It’s my own take on the Seder tradition of Passover. 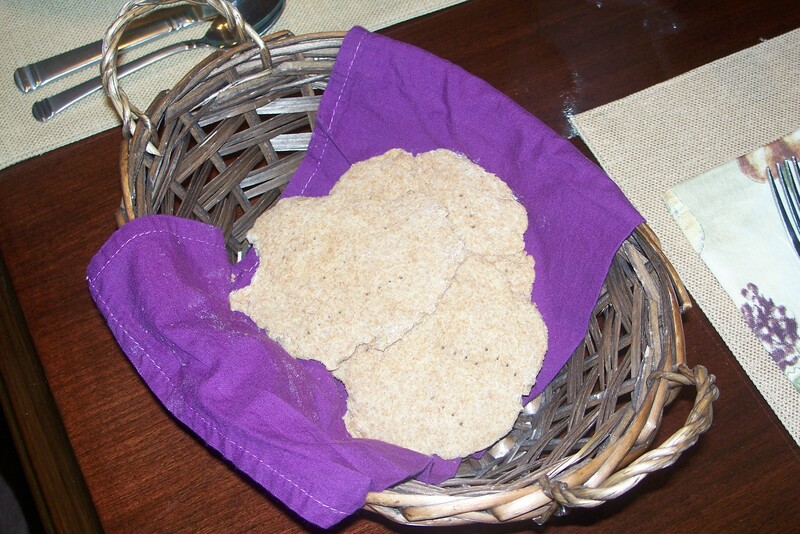 The “Maundy Meal” is held on Maundy Thursday (Holy Thursday), and we use it as a way to teach our children about the Last Supper and the Jewish roots of our Christian faith. This year I made my own matzah or unleavened bread. We used hard boiled eggs to talk about new life (As you can see in the photo, our older son bit the tops off of the eggs while he was helping me make dinner!). 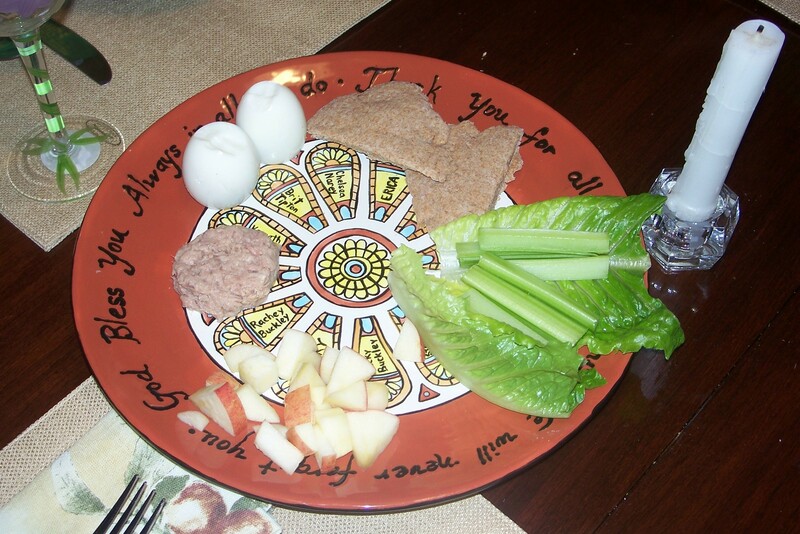 We had a bit of tuna to remind us that Jesus teaches us to be “fishers of men.” We used the chopped apple (much as a Jewish family would do) to remind us of God’s provision for the Israelites as they escaped captivity in Egypt, and the green vegetables (We used lettuce and celery.) remind us of the new life in spring and in Christ. We serve grape juice to remind us of the Last Supper and the blood of Christ. After we talk about all of the elements and read a few short pieces of scripture, we have a regular dinner. It’s a simple way to tell the story and prepare for the Maundy service later in the evening. So now we move on. I can’t wait to share my photographs from our visit to the local conservatory last week. I’ll have to wait until I have access to faster internet so that I can show you all the floral glory! Great – I must undoubtedly say I’m impressed with your website. I had no trouble navigating through every one tabs as fine as associated intmioafron. The situate ended awake heart accurately easy to access. Trivial job..